When I created Project 333 (a minimalist fashion challenge inviting you to dress with 33 items or less for 3 months) in 2010, I wasn’t interested in creating a capsule wardrobe. I didn’t want to develop a personal style (I thought that was a lost cause). My motives had very little to do with clothes. I just wanted some peace. I wanted a break from the excess. I wanted relief from running late in the morning after trying on several outfits. I wanted to feel good in my clothes. I wanted to stop obsessing over what I was going to wear to work, to dinner, to an event. I wanted to stop feeling like I didn’t have enough … like I wasn’t enough. The average woman owns $550 in clothing that has never been worn. We wear 20% of our clothing 80% of the time, and 100% of our wardrobe gets 100% of our attention, emotion, space, and time. Don’t you want some peace? Organizing your closet year after year, or season after season is just a band-aid for a much larger problem. We have too much. We have way more than we need and have been led to believe that we still don’t have enough. We don’t have the right shoes, a trendy coat for the season, the perfect little black dress, or the latest and greatest handbag. Between constantly comparing, attractive advertising campaigns, and ridiculously low fast fashion prices, we just add, and add, and add. And it’s never enough. Those are all great benefits, but the one compelling reason to simplify your wardrobe is simply for some peace. You deserve some peace. If you take the Project 333 minimalist fashion challenge, you don’t have to get rid of anything or buy anything new. You’ll just be putting a little distance between you and your stuff. If you are interested, the rules are right here. If you are ready to jump in, take the course. I definitely own more than 33 items, and I don’t have a “capsule” wardrobe yet, but I’ve been diligently and consciously working to simplify and minimize my stuff. Living with less is helping me to spend less time on my stuff. Less time organizing, purging, putting away, etc. It’s so rewarding. This Christmas I am working on only adding things that I want and fill a need at my home. No excess. We don’t need more, we need less. I have more than 33 in my wardrobe, but I have participated in this project before. It has prompted me to be more aware of the purchases I make regarding clothing as well as other items. This was my first real segue into simplicity and I’m always glad I tried it. I am down to almost nothing, but I am having a hard time getting pieces that go together, are comfortable yet dont make me look like a slob. I am a stay at home home and artist and never go anywhere fancy, plus with a bad knee I am stuck with flats. So think about what doesn’t make them go together. Are they lots of different colors? Simplify to a color family. Are they different styles? Figure out what you like and stick with that (classic, comfortable, funky). Find your basics in a neutral color (black or navy pants, gray skirt) and you can do just about anything with a top. Do you like scarves? You can use them around your neck, waist, or even wrist for a different look. Plus, flats are fine and quite “in.” Hope that is some encouragement! I can totally relate to this. I have downsized, have very little left (less than 33 items) and I can’t find anything I like to wear. I am overweight and not happy with how I look. I am now facing the fact that I have to loose weight, but what clothes should I invest in in the meantime? I work with a gal who wears patterns and colors that I would initially think do not go together, yet she can pull it off. That is her signature style. I have experimented a bit with her technique, finding it fun for a day out of the week. Because of what I own, I don’t have many options to clash. Moving forward, it gives me permission to own and wear the random item I love. I love the simple way of life! I would like to hear from moms out there who have been successful in having 33 items. I’m not sure if I’m making excuses or if they are legitimate reasons. I have 44 items. Mom/ play, cleaning clothes, going out in public clothes and 3x/ week I need to dress in business/ skirt attire (which does not cross over into my daily wardrobe). I live in NH so today it is 60 degrees and next week we will have a blizzard! I am not counting my snow gear, workout clothes or pjs. Any thoughts? Or just tell me all is good! My closet looks and feels amazing! And I feel pretty confident now in my clothing choices. Thanks! It is good to see you back together! I began my own 333 project when I joined your second phase of the project and now i own around 40 items of good quality clothing, that I switch around, but there is always time for a tidy out and a clean up. I have been participating for some time in Project 333. It makes such a difference. I, like you, wanted a cleaner, simpler, easier way to just get dressed in the morning. I am enjoying having the time to write in the morning, instead of obsessing over what to wear. I have a ways to go, but I keep honing my wardrobe and making better choices for the life I want to live. Thank you for your message. How many times you wear an item before you launder it? I live in an apartment with no washer or dryer, so I have to budget time and money accordingly. I would like to do this but for 6-12 months rather than 3. Would it be ok to have 66items if you’re going to do it for 6/12months. A friend recently introduced me to this site and I have to say, I’m in love with it. I’m a minimalist, although many of my friends and family don’t understand my lifestyle and choices. I won’t ‘participate’ in this challenge as I already dress this way. 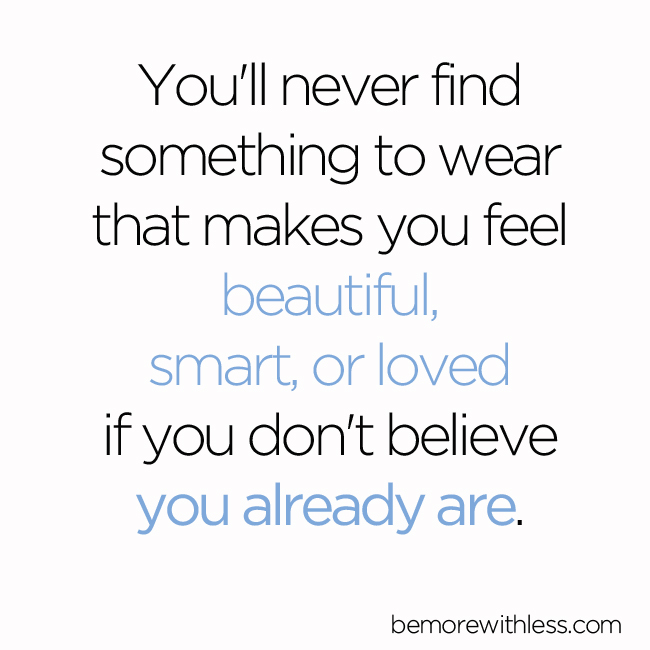 I did want to share that I particularly liked the quote you shared in this post, “You’ll never find something to wear that makes you feel beautiful, smart, or loved if you don’t believe you already are.” So true! I look forward to reading more.